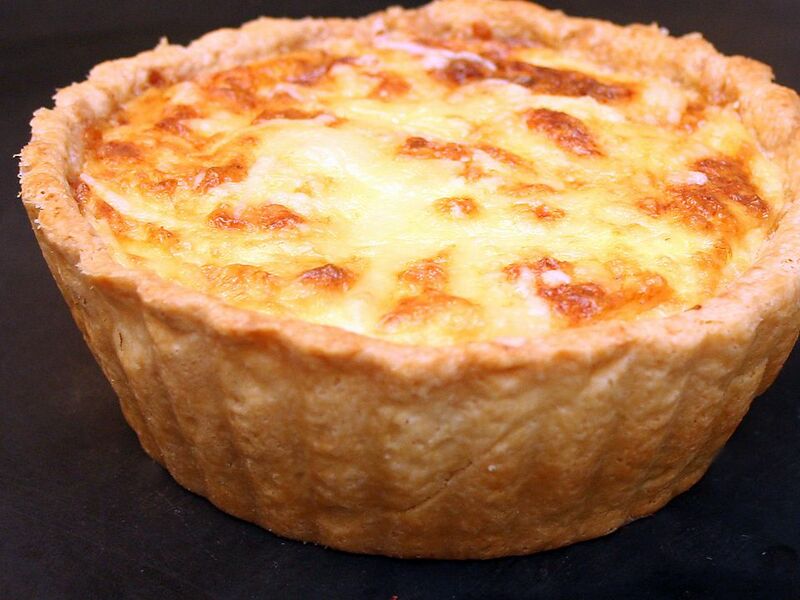 Quiche is a great dish to make when you have small amounts of leftover meat, cheese or vegetables. My favorite combination is the classic trio of bacon, onion and Gruyere cheese, but spinach and mushrooms or roasted red peppers and onions make great vegetarian options. Just be sure that any vegetables you use are cooked and dried off -- uncooked vegetables leach liquid out into the custard, which ruins the quiche. The amount of filling is enough for a pie or tart pan 6 inches in diameter and 2 inches deep; if you're using a shallower pan, you may not need all the custard. I use a pan with a removable bottom to enable me to remove the quiche from the pan before slicing, but you can slice it in the pan as well. Use any crust recipe you like, but be sure to blind bake it or the bottom will become soggy. In a medium bowl, whisk together the eggs, half and half, salt, pepper and nutmeg until thoroughly combined but not frothy. Spread filling ingredients (see below for preparation) over the bottom of the blind-baked crust. Depending on the size of your pan and the amount of filling you use, you may need less custard. If you need more, whisk another egg with 1/4 cup of half and half and add to the crust. Bake 25-30 minutes, or just until the custard is set and the top is very lightly browned. Let cool for 10 minutes or more before slicing. In a small skillet, cook the bacon until browned but not completely crisp. Add the sliced onions to the bacon fat and cook until the pieces separate and soften. Spread the bacon and onions over the bottom of the crust and top with the grated cheese. Thoroughly drain the spinach, pressing as much liquid as possible out. Spread the mushrooms and spinach evenly over the bottom of the crust. Thoroughly dry the roasted red pepper. Spread the red pepper and onions evenly over the bottom of the crust.